I love a bit of Jules Verne, I love the fact that he wrote so long ago, but his novels still shock and surprise me despite the fact that I’m surrounded by technology he couldn’t have dreamed of. What he wrote about, would have been considered implausible at the time, but now that we can look back, he was very accurate in what he imagined. From the Earth to the Moon is a fabulous example of this for many reasons. It tells the story of the Baltimore Gun Club and a few of it’s members, who having realized that there was no longer much need for innovation in the field of guns and cannons, decided to put their energies into something quite different, a trip to the moon. Using their experiences with gun powder they put forward the idea of launching a projectile into space with a giant cannon. 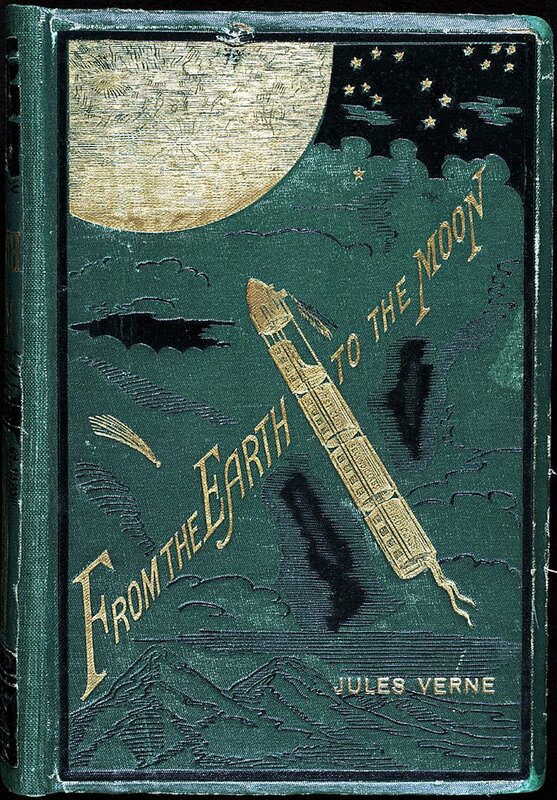 The novel was written in 1865 and set a few years after that, after the end of the American Civil War, but this novel about man’s first voyage to the moon has many parallels with the actual first trip there. Vernes launch site was Tampa Bay, Florida, which is along the same latitude as Cape Canaveral. The shape of the rocket was very similar as was the height weight and speed. It’s amazing to think that one man could plan out such an epic voyage which would take another 100 years to materialize. As for the story itself, similar to other Verne novels, it is quite heavy on the science and facts and figures. Even more so in this than in other novels I have read, there is much talk of number and measurements, in fact there are chapters devoted to the size and shape of the projectile in relation to the distance it needed to travel and the force needed to launch it. Despite the fact that I enjoyed it, at times, it was very difficult to read through all of this to try to get to the story behind it. Because of this, I have to admit this is probably my least favourite Verne novel. Probably because of the fact that it is quite short, but most of it is taken up with long drawn out explanations and measurements that I felt there was not quite as much actual story as I would have liked. For any fans of Jules Verne, definitely give it a go, if just to remind yourself of what a marvelous brain this man had to envision so much, but I wouldn’t recommend this as starting point for his works, he has written far more interesting stories.